This book is about financial and banking products available to Canadians through banks and other financial institutions. It has information about the following: -Investment accounts (e.g. TFSA, RRSP, Locked in, Spousal RRSP, RRIF, RESP) -Bank accounts (e.g. checking, savings, US, youth, student, estate) -Bank services (e.g. cheques, drafts, wire transfer, courtesy overdraft, holding period) -Credit (e.g. loans, investment loans, mortgages, lines of credit, overdraft) -Credit insurance (e.g. life, disability) -Credit cards (including secured cards and gift cards) and how they work -Canadian credit history, how to check and improve it -Government pension, how and when to apply -Investments (e.g. 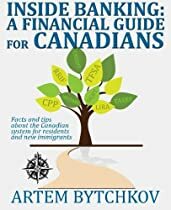 stocks, bonds, ETFs, ETNs, mutual funds, segregated funds, GICs, market linked GICs) -How to save and invest -Canadian tax system -Money and death -Power of Attorney, Enduring Power of Attorney, Personal Directive and Will -Numerous tips (e.g. how to invest, save, increase your cash flow, minimize taxes, get rid of debt) -Advice on various financial subjects -Links to different sites and sources of information The author explains advantages and disadvantages of many products, services and investment options.